Release Date: February 3rd, 2006 (Cinema Village) by New Yorker Films. Directed by Maureen Gosling and Ellen Osborne. In Spanish and Zapotec with subtitles. BASIC PREMISE: A documentary about the Zapotec people of Juchitán, Mexico. ENTERTAINMENT VALUE: Juchitán, located in Isthmus Zapotecs in southern Oazaca, Mexico, looks beautiful and full of life in Blossoms of Fire . What makes it such a unique place to live is that the women play a very large role in their society. Every day, they sell products in the marketplace while their husbands stay at home to clean. They also manage their family’s income. Looks like role reversal. Directors Maureen Gosling and Ellen Osborne do you great job of showing what Zapotec people are generally like with many interviews. In a typical day, women work long hours, come back home to watch television, and then go to bed. They also love have fiestas. It would have been more interesting to focus on one particular family and get to know each individual. 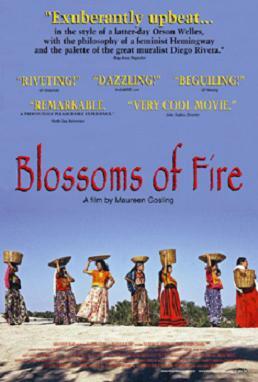 After watching the women dance and talk about how happy they are living there, Blossoms of Fire just seems like a celebration of the Zapotecs. The only real conflict is the threat of industrialization and commercialization, but this only briefly comes up at the end of the film. Nonetheless, it’s somewhat engaging to listen to the music and watch the colorful sights—i.e. their clothing— that makes up the Zapotec culture and lifestyle. RITUAL VALUE: The powerful role of Zapotec women compared to men makes for a potentially thought-provoking study, but Blossoms of Fire doesn’t really go deep enough. It’s nice to know that the husband and wife help eachother out to support their family, but it would have been helpful to listen to sociologists or other experts explore the reasons how these gender roles developed. It’s also satisfying to know how liberal and laid back the Zapotecs are when it comes to sexual preference—it’s no big deal there. Obviously, industrialization threatens the tradition and unique quality of the culture, as one Zapotec woman says, it’s needed to a certain degree as long it doesn’t destroy raw, natural material. Unfortunately, the large topic of industrialization comes up too late and all-too briefly. On a positive note, a woman gives a very powerful, touching quote from a poet at the end of the film. INSULT TO YOUR INTELLIGENCE: Not enough analysis to give insight into the Zapotec culture. IN A NUTSHELL: Lively, colorful and mildly engaging, but not insightful or moving enough.